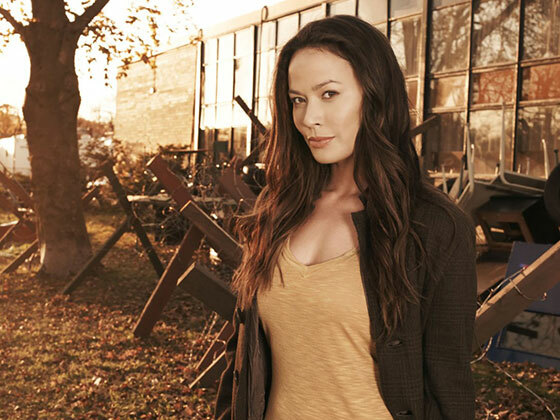 Falling Skies star Moon Bloodgood (pictured above) is to make her European convention debut next month, meeting fans and signing autographs at MCM London Comic Con, the UK’s biggest modern pop culture event. Moon Bloodgood plays Anne Glass in post-apocalyptic sci-fi show Falling Skies, which returns for a fifth and final season later this year. Executive produced by Steven Spielberg, Falling Skies charts the human resistance’s struggle for survival in the chaotic aftermath of an alien attack that has left most of America in ruins. Serving in the 2nd Mass as their main combat doctor, Moon’s character Anne runs the medical unit together with Lourdes. She is also the mother of resistance leader Tom Mason’s Espheni-human hybrid daughter Lexi and acts as a maternal figure for his sons Hal, Ben and Matt. Moon Bloodgood is also well known for fighting for another resistance group, taking on Skynet’s robotic killing machines as battle-hardened pilot Blair Williams in 2009 movie Terminator Salvation. Bloodgood is also know for her role as Livia Beale in TV show Journeyman and as the voice of Uriel in the first Darksiders video game.